Competition is fierce, so how can you step up your game and stand out from the wash down the block? How can you attract new customers, and keep the loyal ones coming back time and time again? Here’s a few ways to make your car wash shine. If you’re not online, it’s about time. Customers often turn to the internet to search for information, promotions, nearby locations and more. A website, a social media presence and up-to-date online profiles will help you share information and promotions that reach your customers instantly. Promotions can drive customers to your site. Customers need the car wash either way, so why not offer them an incentive to get one? A stamp card or prepaid service that offers a discount after a set number of washes is a great way to offer your customer savings and keep them coming back. Customers want an easy, stress-free experience. How easy it is to enter and exit your property. Does the flow of the property make sense? How user-friendly is your sales process? Is your staff friendly and informative? Ensure the choices on your menu are easy to follow and priced right, to make selecting a service a seamless experience. Quality is king, and a clean, shiny, dry car time after time is vital. 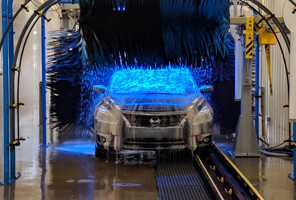 How can you ensure top quality of your car wash? Maintain your systems frequently. Remember, what worked five years ago may not work the best today. If you’re system is starting to lag behind the competition, look at options to upgrade equipment or add new, exciting elements like foaming arches or tire dressing applicators like MacNeil’s Gloss Boss. Consider adding some dramatic visuals, like MacNeil’s AquaFoamer. It creates a thick curtain of foam. Use CleanTouch chemicals in it to create vivid, bright colors, and add an LED light bar for maximum WOW factor. And don’t forget fragrances….most chemical suppliers offer different scents that can even be tailored to the season, such as pine scent for Christmas. Interested in learning more about what MacNeil can offer? Connect with us today.